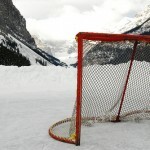 With the colder winter winds approaching, one sport is on everyone’s mind, hockey. One of the fastest and most physical sports played, hockey fans from all over the country gather around the ice to see their home team dominate. Prize insurance companies have seen a large increase in the popularity of hockey promotions over the last year especially during the pro season games. Many companies offer a wide variety of hockey promotion that involve fans from the crowd participating in the contest between periods. Score Shot- This is the most basic yet most popular hockey promotion offered. One contestant will get called down from the crowd to take one shot from center ice or the far blue line (depending on your budget). If they can score a goal through a designated template they win the grand prize. Rapid Fire- Rapid fire is a great contest if you are looking to keep the contestant on the ice for a longer period of time. The participant will be given 25 pucks and 25 seconds on the clock. With an open net, they must get 20 out of those 25 pucks in the goal in order to win. Chuck–a-Puck- Great for the whole stadium to participate in and also an excellent way to raise some money. Fans get to opportunity to buy a foam puck during the beginning of the game, and between the 2nd and 3rd period they have to throw the puck from their seats onto the ice in attempt to get the puck into template located on center ice.